Abstract: The Pearl Project, named for Wall Street Journal reporter Daniel Pearl, is a collaborative investigative reporting course in which students learn to employ the same information gathering skills used by working journalists. The project is organized like a newsroom. Students receive a real-world assignment, choose beats, map reporting strategies, develop primary human sources, conduct interviews, cull databases for information, collaborate, collate complicated information, resolve ethical dilemmas, analyze information, write stories and create multimedia packages. By doing first-hand reporting, students gain an appreciation for the challenges of reporting and the deep sense of accomplishment that comes from successful information gathering. Rationale: The Pearl Project is designed with the belief that students learn best by doing. The course is designed to introduce students to the most rigorous information gathering challenges that working journalists face and to help them develop the skills, strategies and methods to collect, collate and analyze information for multimedia publication and broadcast. With the model of the Innocence Project, headquartered at the School of Law at Yeshiva University to investigate alleged wrongful convictions, the Pearl Project is designed to be a collaborative investigative reporting team project conducted in journalism courses. And in the spirit of the Arizona Project, an investigative reporting project by journalists into the 1976 murder of Arizona Republic reporter Don Bolles, the Pearl Project centers on investigating the death of a journalist in the line of duty and completing that journalist's work, or investigating the circumstances around a journalist in peril and completing that journalist's work. With more than 300 journalists killed worldwide over the past five years, investigating their deaths and continuing their work has become a critical component in protecting the enterprise of journalism in the 21st century, and there are no purer hearts than students to do noble work. 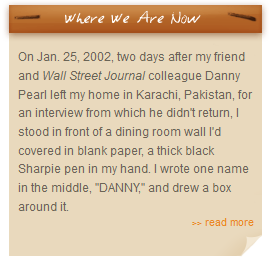 The first Pearl Project investigated the kidnapping and murder of Wall Street Journal reporter Daniel Pearl, who was kidnapped and murdered in Karachi, Pakistan, in 2002. The project gives students a tangible link to journalists who are dedicated to the craft and gives students a real-world appreciation for the challenges facing journalists in the modern day. Methodology & Implementation: As professors of the Pearl Project, we identify the focus of our investigation in the semester before the start of the course. We register the class with a course description detailing the subject of the investigation, and we invite students to submit 500-word essays to explain why they want to be in the course. This is critical in identifying writing and critical thinking skills in students, as well as recognizing students who will take initiative, show personal commitment and be positive team players. Launch: The first day, we introduce the reporting assignment and give students a chronology of facts. We attempt to instill in the students a sense of the noble history of investigative reporting that they are inheriting. We discuss the assignment as a newsroom, and the class defines the reporting beats that it deems most relevant to completing the project. Since the investigation typically involves crime or suspected crime that has received media coverage and gone through some process in the judicial system with possible political overtones, beats include: the journalist (through at least their work and correspondences), the journalist's family, friends and colleagues, law enforcement, attorneys, media and politics. We give the students reading assignments related to the investigation, including books, articles and radio and TV interview transcripts. The students are assigned the task of writing 500-word essays on the beats on which they would like to work, the reporting strategy they would take and possible human sources they would interview. Beats: By week two of the course, the students are assigned their beats and their beat partners. A specific student is assigned to be the videographer, and another student is specifically assigned to be the project photographer. The beats are organized into teams with a team leader designated to coordinate the team members' work. Research: Students immediately look for open source information, such as media articles, related to their beat, using Lexis-Nexis and other online database searches. Gumshoe reporting: Students identify human sources with first-hand information. Early in the course, we conduct interviews in the classroom together so students can practice gathering information from sources using deft interviewing skills. We encourage students to meet sources face-to-face, whenever possible, to solicit better interviews.